So, I finally got around to playing Portal. Anyway, it's no longer free, but even still, it's worth the money. Portal is one of the more original and engaging games to come along in a while. (Again, assume that I'm writing this five years ago when everyone in the world else discovered this.) You are given little to no instructions aside from how to move around, and no backstory to orient yourself--you're in some sort of testing environment for a laboratory, but the purpose and extent of this training is left vague. You don't get to control any weapons, and your level of destruction is pretty minimal--a few sentry robots get destroyed here and there, and there are plenty of pools of acid for you to fall in, but the game is remarkably non-violent. It's a puzzle game that looks like a first-person shooter. Of course, the concept of the game is the portal gun: you have a gun that is capable of creating a portal, where you jump in one entrance of the portal and come out the other. This very simple mechanic leads to various puzzles involving physics, moving platforms, and hidden rooms. You have to deflect energy pellets and defeat the aforementioned sentries, all while using one simple concept. You aren't given a time constraint, so you can fuss around all you want to find the solution. While you can die, the times you can die are pretty obvious, and you're only set back a short while (although frequent saves are still recommended). While the gameplay itself is fun, it's also very short: it only provides about four to six hours of play total. And while there are 19 levels, you'll breeze through the first dozen or so in a half hour at most. Around the mid-teens the complexity ratchets up significantly, and you'll find long, multilayered challenges you have to think six steps ahead for. 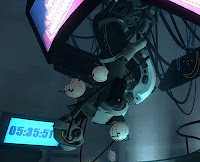 But none of this matters, because the best part of the game is GLaDOS, the computer that aids you on your way. Your journey to the end is a true psychological thriller, as you realize the intentions of your supposed benefactor are not what they seem. Announcement slowly get more and more aggressive and cryptic, and are written and delivered with a perfect combination of humor, assertiveness, and dread. The game takes place in a sanitized laboratory, but you get a few peeks here and there of the ductwork and storage rooms, full of half-crazed scrawlings of the test subjects before you. Since they're not specific, they must fill you with dread as to what is coming next. There are no characters besides yourself and GLaDOS, and you even only get glimpses of yourself if you set the portals up right--the fact that you can only partially see yourself is even more creepy than if you never saw yourself or were able to see everything. The contrast between the sleek, clean lab floors and the dirty, noisy, dangerous back rooms just adds to the impending gloom. Anyway, while I think that the game is original, there's no doubt that parallels can easily be drawn to HAL from 2001: A Space Odyssey. While the concepts and even motives are roughly equivalent, the personality is sufficiently different as to be considered independent. Of course, the game is not without its flaws. It is too short, and some of the puzzles rely a little bit too much on finding an obscure place to place a portal; I occasionally checked walkthroughs on the internet, just to confirm I was doing the right thing, just a few pixels off. There is very little positive feedback, so a frustratingly long puzzle leaves you with nothing to show for it. While I won't say much about the ending, a little more background could have been useful--although the deliberate vagueness of everything is part of the charm, so I'm not sure if that would be positive. The internet is full of young video game players looking for speed-plays and minimum-portal wins. To me, this defeats the purpose of the game. Unlike so many other big-budget games, Portal encourages experimentation and patience. It's not whether you can kill everyone in record time or force your way through brute force, but whether you can experiment and have fun. Is this game for everyone? Probably not; overly assertive players only looking for war and conflict in their games will be bored; the easily frustrating will give up; and hard-core sci fi apologists will probably find the storyline mundane. Personally, I enjoyed it, and look forwarded to playing Portal 2. In, probably, five years or so. *This experiment is still ongoing.